Make the most of the short British gooseberry season with this elegant summer salad recipe. 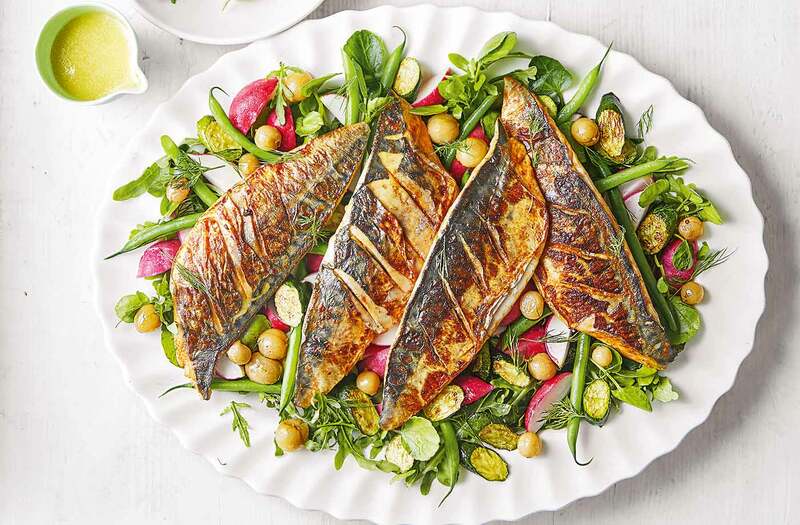 Tangy, fresh gooseberries are a delicious accompaniment to oily fish, such as mackerel – plus, the colourful salad is ready in just 30 minutes. Boil the green beans for 3 mins, then drain and set aside. Mix the gooseberries with the sugar and 2 tbsp water in a small pan. Heat gently for 3-4 mins until softened but still holding their shape. Make 4 slashes in the skin of the mackerel with a knife. Brush all over with harissa; season with a little salt. Heat the oil in a frying pan over a medium-high heat. Fry the courgettes for 3 mins until golden; remove from the pan. Add the mackerel, skin-side down; fry for 3 mins until crisp. Flip and cook for a further 1 min until cooked. Meanwhile, mix the dressing ingredients together and season with salt, pepper and a pinch of sugar. 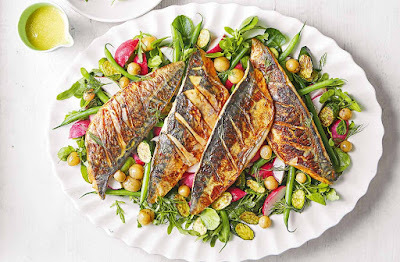 Arrange the salad leaves, dill, radishes, beans and courgettes on a platter and lay the mackerel on top. Scatter over the gooseberries and drizzle over the dressing.